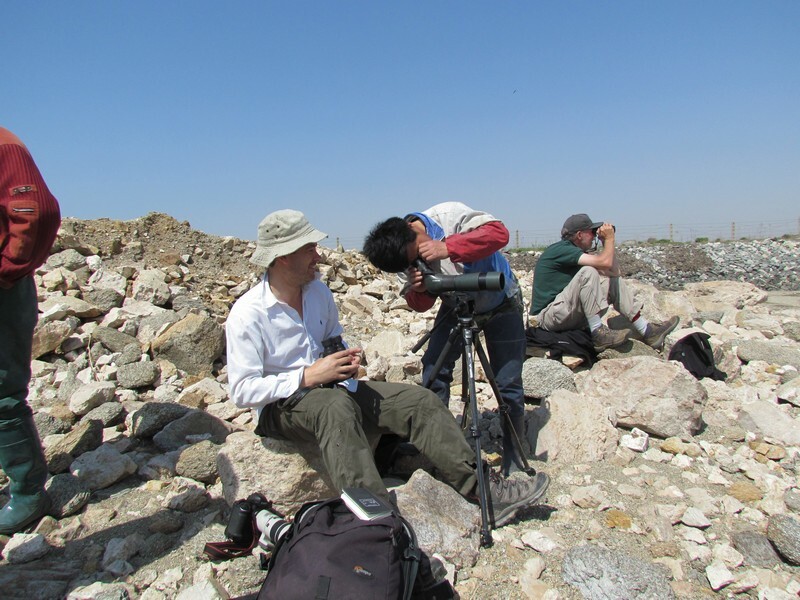 Last weekend I hired a car and drove to the Bohai coast south of Tangshan (唐山) – specifically to the Nanpu Development Zone – to look for waders. It took me a little over two and a half hours to drive the 200km from Beijing to the coast, mostly along the excellent G1 highway, and it didn’t take me long to find a suitable hotel relatively close to the coast at which to base myself for 2 days. The Nanpu Development Area is vast and the changes taking place, including land reclamation, are on a mesmerising scale. There were heavy lorries and large machinery almost everywhere and, apart from the birds, it would be a very depressing place to spend a few days. 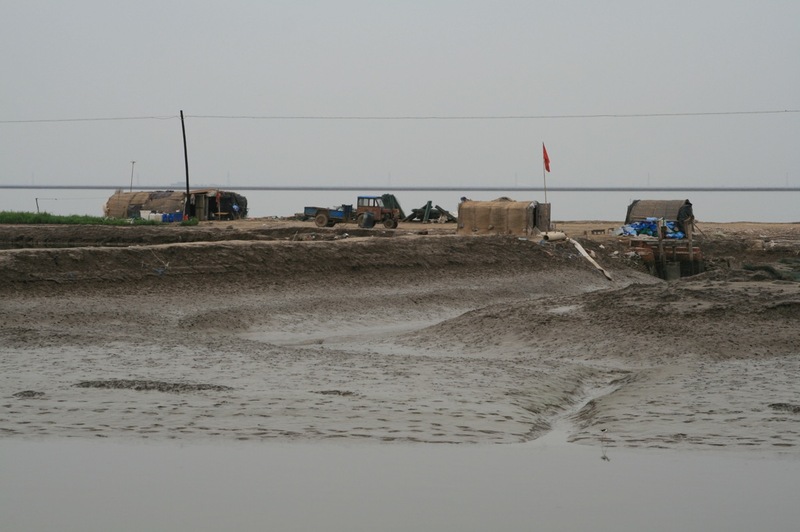 From the small town of Nanpu, south of Tangshan, it is still a 30km journey along relatively narrow roads, through a prison, to reach the mudflats. The city of Tangshan, a little to the north, is famous for a huge earthquake that killed over 250,000 people in 1976 and there were signs for memorials and museums as I skirted the city on my way to the coast. 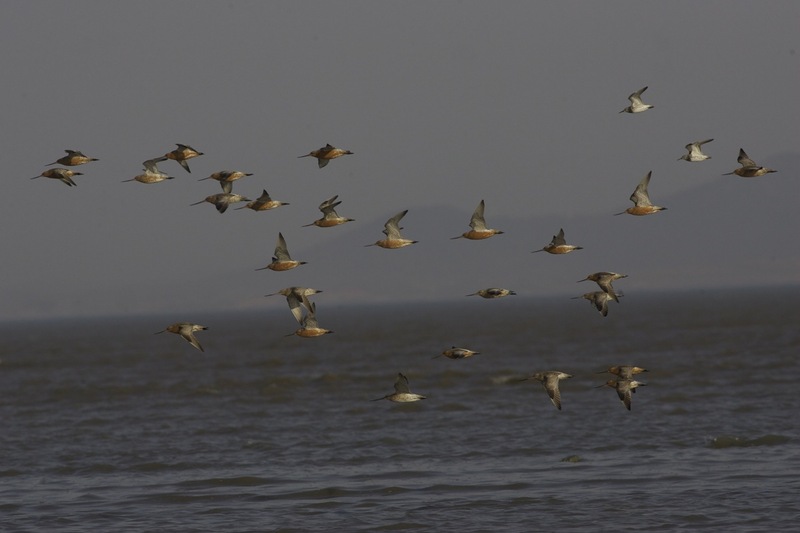 A Beijing-based PhD student, Yang Hong-yan, has been studying the waders in the Nanpu area – specifically the spring migration of the Red Knot – and has extensively covered the area from March to May in the last few Springs. I am very grateful to her for sharing her knowledge (including maps and directions), without which I would have almost certainly got completely lost in the labyrinth of dirt tracks and roads that criss-cross the fish farms and salt works in this area. Once I had checked into the hotel, I began the journey to the coast to check out the area in preparation for a full day’s birding the following day. I followed Hong-yan’s directions with a little trepidation as she advised me that the best route was to take a road that ran “directly through a huge prison” and that I “shouldn’t get out of the car or have any of my optics on view” when I was on this section of the road, no matter how tempting the flocks of waders looked! Hmm, I thought.. this could be interesting – a foreigner on his own in a Beijing-plate car driving through a Chinese prison. Still, she assured me that I would “probably be ok” and, with that encouragement I reached the entrance to the prison where I was met by a delegation of what looked like Chinese army officers. They seemed to be operating a policy of stopping a random selection of vehicles, controlled by one officer standing on a box and waving either a red or a green flag, depending on whether that vehicle would be stopped. Surprisingly, I was given a green flag and waved through. There was a large and forbidding-looking fence on either side of the road, beyond which prisoners were working in the salt works. It looked like extremely hard manual work and I began to wonder what crimes these people had committed and in what conditions they lived. They looked desperate. My mind was soon back on birds when I began to see flocks of Black-winged Stilts on some of the ponds.. hundreds turning into thousands.. they were everywhere (I estimated 3,000 along this stretch alone). And amongst them I could see there were other waders – I could make out Godwits but many of the others were too distant to identify with the naked eye and, following Hong-yan’s advice, I had no intention of stopping the car along this road. After several kilometers, I reached the other side of the prison and, again, was greeted by a group of soldiers. They were stopping all vehicles leaving the prison, apparently checking for stowaway prisoners.. With a combination of my broken Chinese and innovative sign language (they were pointing at the boot! ), I could sense that they wanted to look into the boot of the car. Using mirrors on long poles, one guard checked the underside of the car while another looked with some concern at my tripod and telescope in the boot.. I explained that I was birdwatching and, with a warm smile, he indicated to the flag man that all was ok and I was given the green flag to continue. Phew. The drive from here to the coast was very ‘birdy’… there were pools on my right-hand side, many holding good numbers of waders and, on my left, there was a tidal creek hosting good numbers of Sharp-tailed, Marsh, Common and Wood Sandpipers. Given the width of the road and my uneasiness at the proximity of the prison, I did not stop and drove on. The next few kilometers were the same – lots of birds – and I soon found a couple of tracks off to the side that allowed me to pull off the road and scan.. I saw Bar-tailed and Black-tailed Godwits, hundreds of White-winged and Whiskered Terns, Gull-billed Terns, more Black-winged Stilts, Common Greenshank, Redshank, Spotted Redshank, Avocet, Kentish and Little Ringed Plover, Grey Plover, Wood Sandpiper, Far Eastern and Eurasian Curlew, a few Black-tailed Gulls and a single Grey-tailed Tattler. Wow.. Knowing that the high tide was due, I pressed on to the coast and, as I reached the mudflats, the road ended and a dirt track branched off to the right along the sea wall. I parked up about 2 km along the track in an area that allowed me to scan the mudflats and also watch the waders fly over the seawall to an area of flooded pools that provided a good roost site for the birds until the mud was uncovered again on the falling tide. 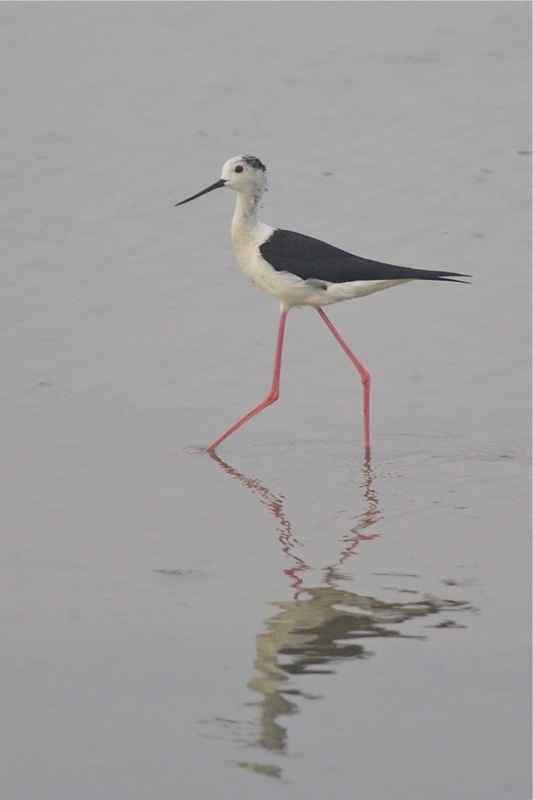 Black-winged Stilt, Nanpu. Easily the most common bird at this site. Despite it being late afternoon, it was hot and humid. Around 35 degrees C without a breath of wind and, even with a hat and lots of water, it was not the most pleasant of conditions and I was constantly wiping my brow to stem the flow of sweat into my eyes.. Nevertheless, it was very good to be birding on the coast and seeing waders. This area produced good numbers of Curlew – both Far Eastern (34) and Eurasian (29) – on the mudflats that gradually made their way closer to me as the tide pushed in. Some Saunders’ Gulls (12) occasionally passed along the sea wall and a few Pacific Golden (4) and Grey Plovers (14) fed on the mud alongside many Kentish Plovers (c80) and a single Lesser Sand Plover. On the inland side of the seawall, a party of 56 Great Knot, 2 Red-necked Stints, 23 Spotted Redshank, 48 Marsh Sandpiper, 7 Common Sandpiper, 29 Sharp-tailed Sandpiper, 4 Common Redshank, 3 Wood Sandpiper, 34 Avocet, 2 Terek Sandpiper and a single Grey-tailed Tattler all loafed on the edges of the lagoons. A Long-tailed Shrike hunted from the wires along the sea wall and 2 Dark-sided Flycatchers fed on insects in the nearby shrubs. 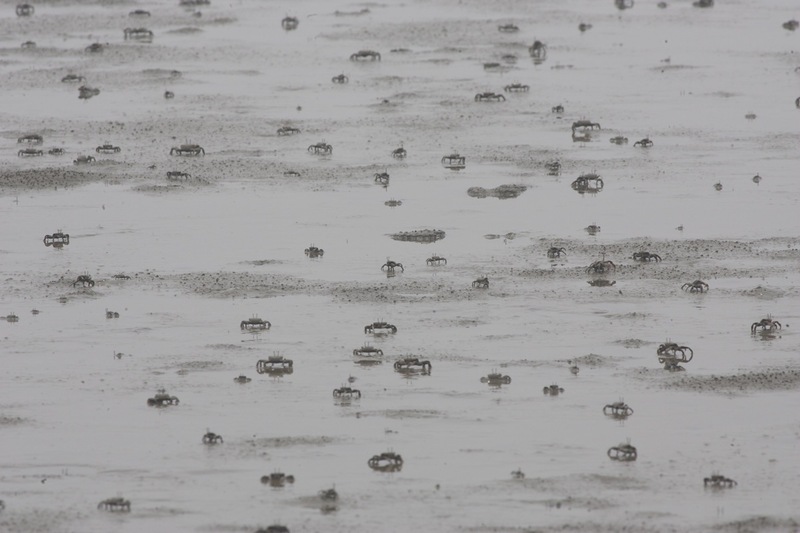 The visibility was poor on my first evening on site, so I wasn’t able to see the full extent of the mudflats or the birds that were using them but I left that evening having a good feel for the site and the areas that offered most promise. 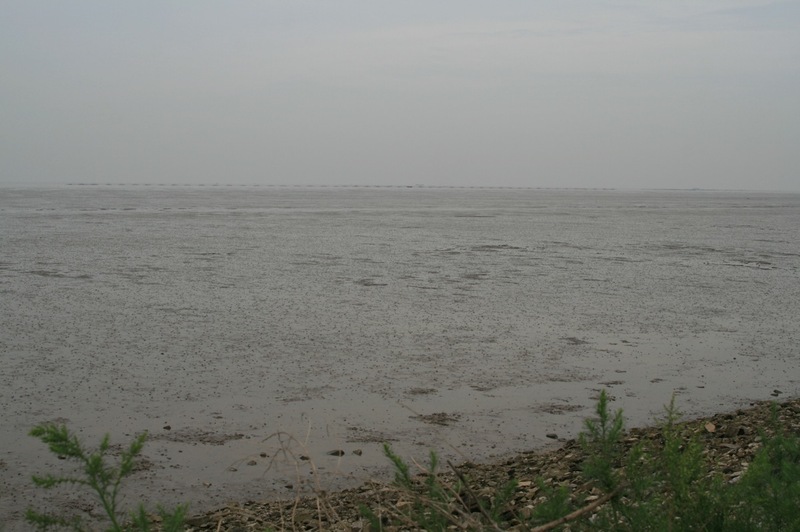 The mudflats at Nanpu from the seawall. Visibility was poor on day one. After a delicious meal in a small local restaurant, where I was treated as if I was the first foreigner many of the locals had ever seen, I retired early and made an early start the next day. 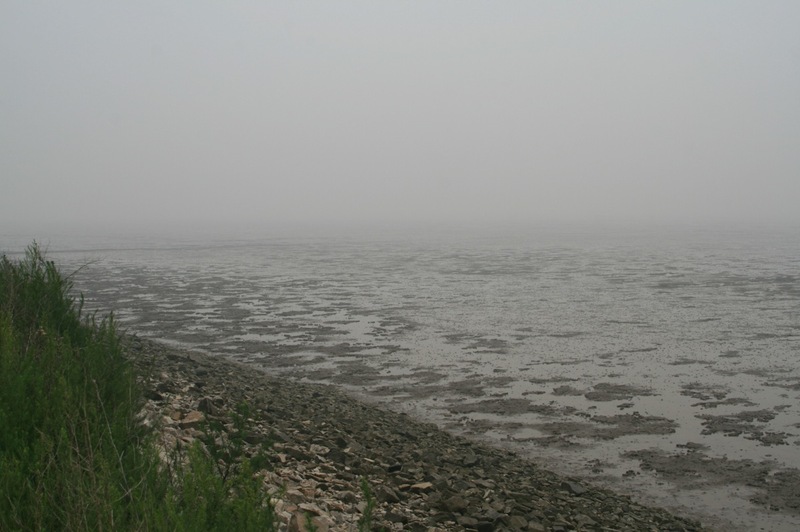 The day started out very foggy but, thankfully, by the time I had made my prison break, it had cleared a lot and on arrival at the mudflats I could see for around two miles. 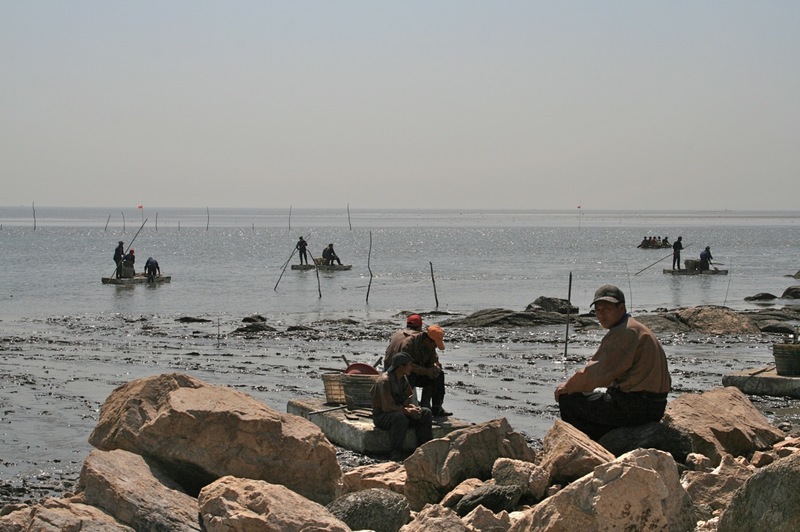 It was at this point that I could appreciate the full scale of the area.. everywhere I looked out to sea, I could see local people digging for shellfish or checking nets on the mud. Heavy machinery – cranes and earth-movers – punctured the skyline. 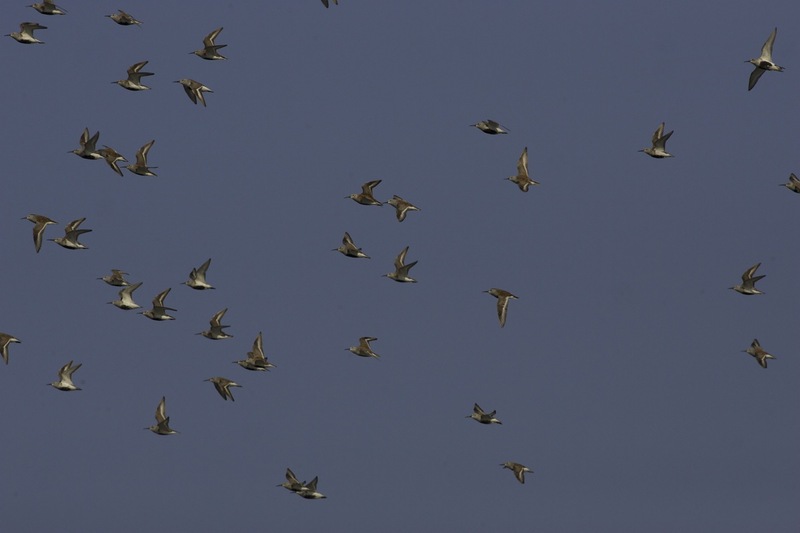 Despite this unnatural setting, there were birds.. not huge numbers but a good variety. After a few minutes of scanning I looked up to see a gull fly overhead and land on the mud a few hundred metres away. It had a black hood and, from the underwing pattern in flight and its structure I thought it could be a Relict Gull. I trained my telescope onto it and, sure enough, there was a stunning Relict Gull, just beginning to moult from its breeding plumage. I made some field notes and enjoyed watching this rare gull preen and feed. Relict Gulls have a very distinctive front-heavy look and they patrol the mud looking for crabs in a manner reminiscent of plovers. On another stretch of mudflats, in amongst some local crabbers, there were at least 50 of these gulls feeding at low tide.. a really great sight and, trumping my spring sighting of a few flyovers at Yeyahu in Spring, these were my best ever views of Relict Gull. 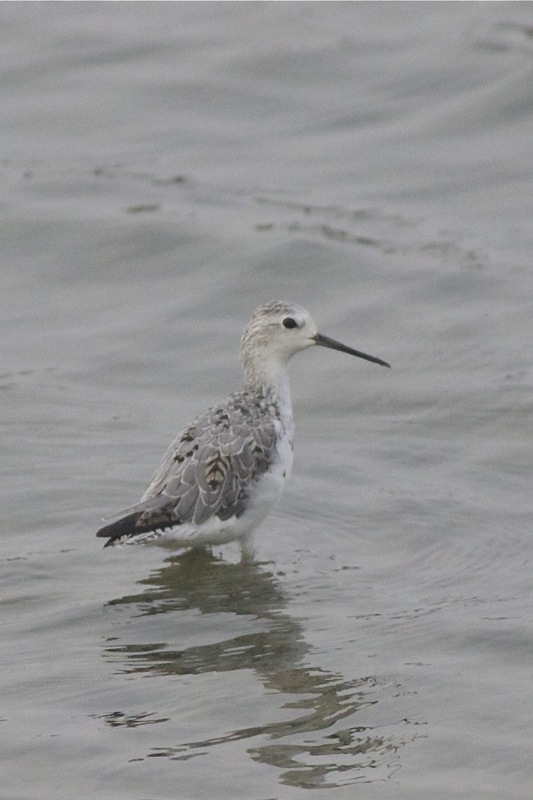 Other birds on view included Bar-tailed Godwit, Far Eastern and Eurasian Curlew, Great Knot, Terek Sandpiper, Grey Plover, Kentish and Little Ringed Plovers, a few Black-headed Gulls, small numbers of Red-necked Stint and both Gull-billed and Little Terns. On the roost were loafing Black-tailed Gulls, a few Black-headed Gulls, Avocet, Black-winged Stilt, Sharp-tailed Sandpiper, Grey-tailed Tattler, Red-necked Stint, Grey Plover, Pacific Golden Plover, Common, Gull-billed, Little, Whiskered and White-winged Terns and Wood and Common Sandpipers. After waiting until the tide pushed off all of the birds from the flats I began to make my way back towards town, stopping to check the roadside pools. More Black-winged Stilts, Sharp-tailed Sandpipers and Kentish Plovers… Then I saw a much smaller pool with lots more birds and there was a track that went alongside, enabling me to view with the sun behind me. There were lots of Bar-tailed and a few Black-tailed Godwits, Marsh, Wood and Common Sandpipers, two Red Knot, Greenshank, Spotted Redshank, Avocet and the omnipresent Black-winged Stilt. Amongst the Bar-tailed Godwit I spotted a slightly smaller godwit-like bird with a straight all-dark bill and dark legs. 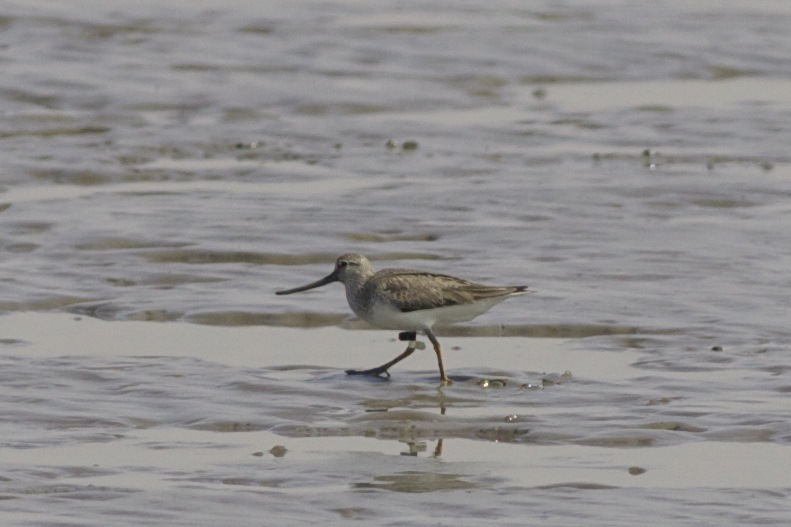 An Asian Dowitcher! A new bird for me. Soon I got onto a second bird – this time a juvenile (quite early?) 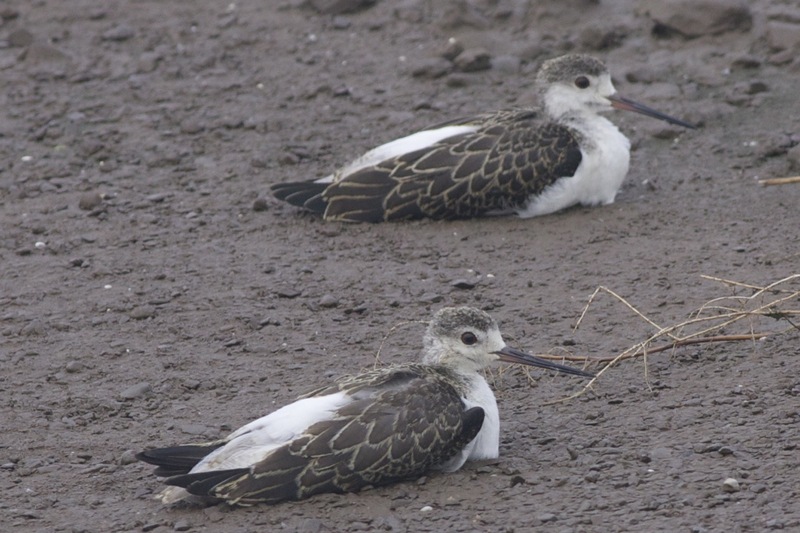 – and I watched these two birds for some time as they fed with the godwits. The ‘tramlines’ along the back, together with the straight bills, helped me to pick out these birds quite easily in the group. A local fisherman walked past and flushed all the waders and, after waiting a few minutes to see if they would return, I carried on when it was clear that the birds had dispersed. 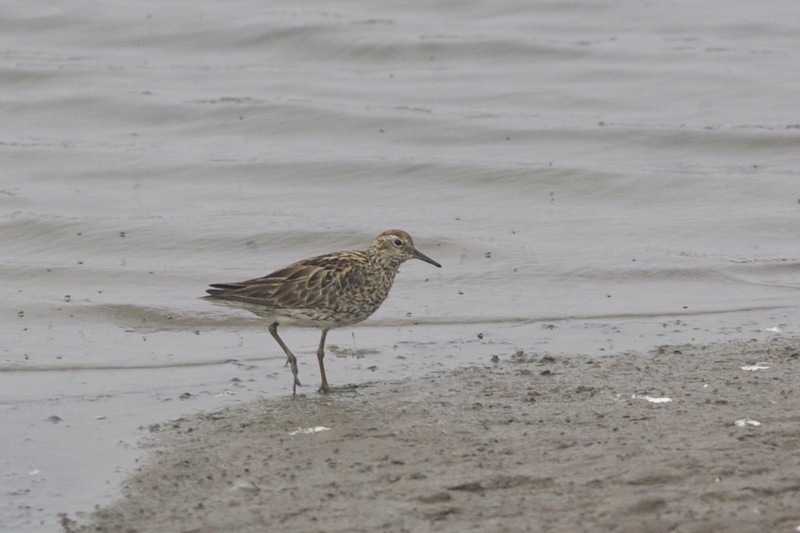 Sharp-tailed Sandpiper at Nanpu. A common bird during my visit, preferring the muddy edges of tidal creeks. A single Kestrel was the only raptor I saw and the rest of the supporting cast included Black Drongo, Tree Sparrow, Grey and White Wagtails, Common Magpie, Vinous-throated Parrotbill, Great Cormorant, Yellow and Great Bitterns, Grey Heron, Little and Great Egrets. 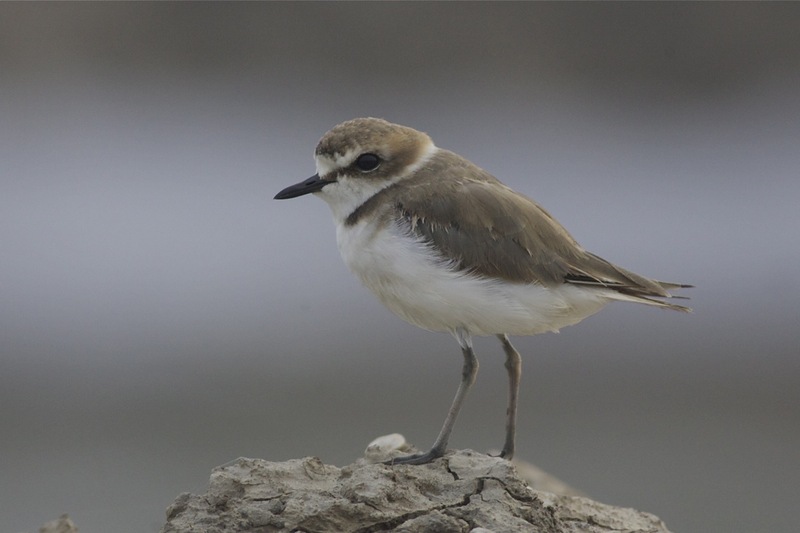 I spent the following morning at the same spots, enjoying a lovely encounter with a feeding flock of marsh terns, before heading back to Beijing around lunchtime in time to return the hire car for 5pm. 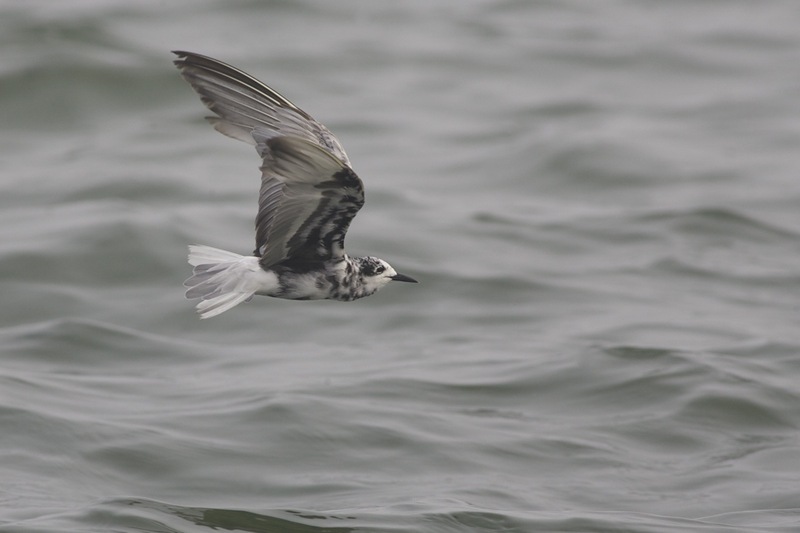 Moulting adult White-winged Tern, Nanpu. I enjoyed a flock of over 200 of these birds, together with Whiskered Terns, feeding low over the water on a roadside pool. A thoroughly enjoyable couple of days in a challenging setting. The development is relentless but, despite this, the birds are there and seemingly adapting to the ever-changing shape of the environment. 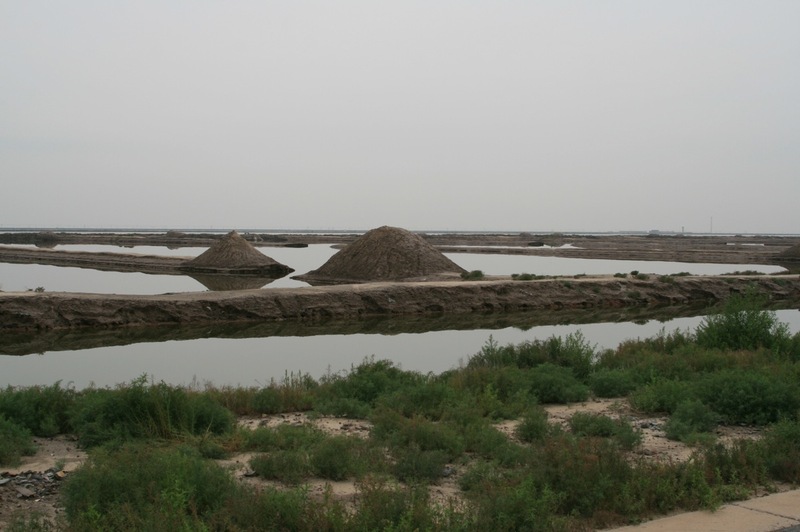 One can only hope that at least part of the mudflats of the Bohai Gulf are protected from land reclamation to ensure that this important stopover is not completely lost.